The U.S. dollar has just been knocked down and forced to serve the interests of the world against the will of the American people. The dollar has been Shanghaied! The term “Shanghaied” refers to the 19th-century practice of sailors forced to serve against their will on vessels bound for Shanghai and other ports in China. Victims were often from West Coast port cities such as San Francisco, Portland and Seattle. Tactics used included kidnapping, beatings and forms of trickery. In the 19th century, trade between the U.S. and China was booming. But there were persistent shortages of able-bodied seamen to sail the cargo vessels. Each vessel had a boarding officer whose job it was to find the crews. Boarding officers were paid by the number of bodies they could round up before the vessel set sail. This pay was called “blood money” for good reason. The law at the time said the once a seamen “signed on” with a vessel, it was illegal to leave the ship until the journey was complete. Jumping ship at any point in the journey would result in imprisonment. A common tactic was to confront a seaman in a dark alley, knock him unconscious, forge his signature on the manifest and drag him aboard. The seamen would regain consciousness after the vessel left port. At that point, there was no choice but to finish the journey or jump ship when he could. Most finished the journey. Next stop — Shanghai! Based on the best information we’ve been able to obtain, it looks like the dollar has just been Shanghaied by the G-20 (the unelected, unaccountable group of 20 nations that collectively control the world monetary system). This could be the most important financial development of 2016, with enormous implications for you and your portfolio. Once again, the city of Shanghai is the center of attention. This new effort to knock out the dollar was contrived in a secret meeting in Shanghai on Feb. 26. The list of names reads like a rogues’ gallery of central planners and currency manipulators. Janet Yellen from the Fed, Christine Lagarde from the IMF, Mario Draghi from the ECB and U.S. Secretary of the Treasury Jack Lew were all there, along with their central bank and finance ministry counterparts from Japan, China and the other BRICS. Here’s the “class picture” of those who attended the G-20 conclave, with some of the main players identified. The main meeting of the G-20 finance ministers and central bank governors was no secret. It was conducted with much fanfare and publicity. Thousands of reporters descended on Shanghai to cover the proceedings. A side meeting of a core group consisting of the U.S., Europe, Japan, China and the IMF was a secret. This group really calls the shots. The U.S., Europe, Japan and China together represent over 70% of global GDP. The IMF acts as a kind of facilitator for these secret meetings, and an “enforcer” for whatever agreements are reached behind closed doors. The outcome of this secret side meeting was the biggest dollar take-down operation since the famous Plaza Accord of 1985. The Plaza Accord was orchestrated by James Baker, who was Ronald Reagan’s secretary of the Treasury at the time. The dollar had increased almost 50% between 1980–1985, and reached an all-time high that year. The strong dollar was hurting U.S. exports and jobs. The Plaza Accord was a coordinated effort by the U.S., France, West Germany, Japan and the U.K. to weaken the dollar. It worked. The dollar fell 30% over the next three years. The U.S. economy got a second wind, and the long Reagan-Bush expansion continued. Now the dollar is at a 10-year high on major indexes. It’s time to trash the dollar again. But the U.S. does not have the same skillful leadership we had in James Baker. This time, the big winner won’t be the U.S.; it will be China. The losers will be the same — Japan and Europe. Currency manipulations are negative-sum games. One country can get a small temporary boost from devaluation, but trading partners are worse off, and the world is worse off. Ultimately, even the country that devalued first is worse off after others retaliate. However, a new theory of currency manipulation was created by Ben Bernanke. This theory says that if every country eases at the same time, everyone gets the benefit of easing, but exchange rates don’t change much because of the coordinated timing. Bernanke called this “enrich thy neighbor,” in contrast to the original “beggar thy neighbor” name given to currency wars in the 1930s. The concept of cooperation and coordination among the central banks can be carried several steps further. Several countries can ease or tighten at the same time in order to give one country some relative benefit by design. Central banks can give targeted relief to one country if they all cooperate in a secret plan. Central bank policy changes work through expectations as much as actions. In traditional policy, a central bank eases by cutting rates or tightens by raising rates. But it can also ease by raising expectations about a rate increase and then doing nothing. If markets price in a rate increase and the central bank does nothing, markets can rally on the news. This is like an invisible rate cut, based solely on changed expectations. Having multiple central banks manipulate expectations and coordinate policy behind the scenes is complex. These efforts are doomed to fail because of unintended consequences and exogenous shocks. But that won’t stop the big brains from trying. This brings us to China’s shock devaluation of the yuan last August. Because China had not managed expectations, this shock destabilized the global financial system. The IMF and the Fed were quite upset that China was not playing by the rules of the game. On the other hand, China did not care much about the rules, because their economy was sinking under bad debts and capital outflows. China acted in its best interests regardless of the global impact. With this background and the recent yuan shock in mind, the global financial powers descended on Shanghai in late February. The G-20 central bankers and finance ministers agreed that China needed help. It’s the world’s second-largest economy and it was falling fast. There was some danger it could take the world down with it. But further yuan devaluation was not possible (in the short run) because it was too destabilizing to markets. The solution is to weaken the yuan on a relative basis by strengthening the currencies of China’s major trading partners, Japan and Europe. In other words, if the yen and euro get stronger, that’s the same as making the yuan weaker, but without the shock of Chinese devaluation. Since this secret deal was worked out on Feb. 26, the first chance the central bankers had to put their plan into action was mid-March. The ECB met on March 10. The Bank of Japan met on March 15. The Fed met on March 16. All three central banks would be able to implement the secret plan in just five business days. Now it was “game on” for the biggest currency manipulation since 1985. Yet how could Japan and Europe tighten without explicitly raising rates? They did it by raising expectations. Markets thought Draghi’s ECB “bazooka” would be long lasting. Markets expected Kuroda of the Bank of Japan to do more aggressive QE. In fact, Draghi did the minimum necessary, and then said he was done doing more. Kuroda did nothing. Both decisions acted like tightening relative to expectations. The euro and yen went up against the dollar immediately. Comparatively, the yuan went down with no explicit devaluation by China. This was the new Shanghai Accord in action. The dollar declined 30% after the coordinated action at the Plaza Accord in 1985. The dollar’s recent strength since the all-time low in 2011 is also shown. This is the period leading up to the new Shanghai Accord, also shown. Will the dollar now plunge 30%, as it did after 1985? It might. If that happens, the shock waves will be felt in every market in the world. U.S. stocks will get a lift, Japanese stocks will get crushed and gold will soar. The Shanghai Accord will be a game changer depending on how hard the insiders push their new playbook. The Fed took a slightly different tack in this plan. Markets pay most attention to the yuan/dollar cross-rate; that’s the one the Chinese government manipulates. The yuan/euro and yuan/yen cross-rates just go where they go based on the euro/dollar and yen/dollar crosses. The dollar cross-rates are the ones markets pay most attention to. With Europe and Japan tightening and the U.S. easing at the same time, nobody noticed that China effectively devalued, because the yuan/dollar cross-rate was unchanged. Neat! Europe is a larger trading partner to China than the U.S., so the yuan/euro cross-rate is actually more important to the Chinese economy. 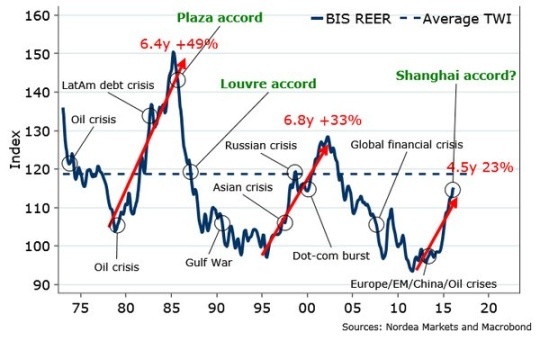 What happened under the Shanghai Accord was a coordinated devaluation that went unnoticed because China took no official action and the yuan/dollar cross-rate was unchanged. It was an invisible devaluation of the yuan. Japan and Europe were the losers in this round of currency manipulations. Japan was the winner in 2013 with Abenomics. Europe was the winner in 2014 with negative rates and Euro QE. Now it was the turn of China and the U.S. to get a lift. The U.S. and China are the world’s two largest economies. If they go down, the whole world goes down with them. Both economies were showing signs of weakness. It was time for Europe and Japan to give it up to China and the U.S. That’s the legacy of the Shanghai Accord. What’s next? There’s another secret G-20 meeting on April 16, 2016. This will take place on the sidelines of the IMF spring meeting in Washington, D.C. I’ll be in Washington then reporting from the front lines. At the April conclave, I expect the Big Four (Japan, U.S., the eurozone and China) to leave exchange rates alone for the time being. They’ll want time to evaluate their work following the Shanghai Accord before taking next steps. The Big Four may later want to run the Shanghai playbook again just to give China more breathing room. The Shanghai Accord seems like a success for the central banks. This means the Big Four will want to try it again to ease financial conditions in the U.S. and China. They won’t push it too far, because Japan and Europe are fragile. We’ll wait to see the indications and warnings before the April meeting. For now, a stronger yen and stronger euro are both in the cards. The consequences for Asia of a stronger yen and weaker yuan are not difficult to discern. Japanese corporate profits will be hurt two ways. Japanese exporters will be hurt because their products will be more expensive for foreign buyers. Japanese multinationals will be hurt when their overseas earnings are translated back into yen. It’s a double-whammy for the Japanese stock market. The Shanghai Accord happened in stealth, but it will go down in history as a major turning point in the international monetary system.